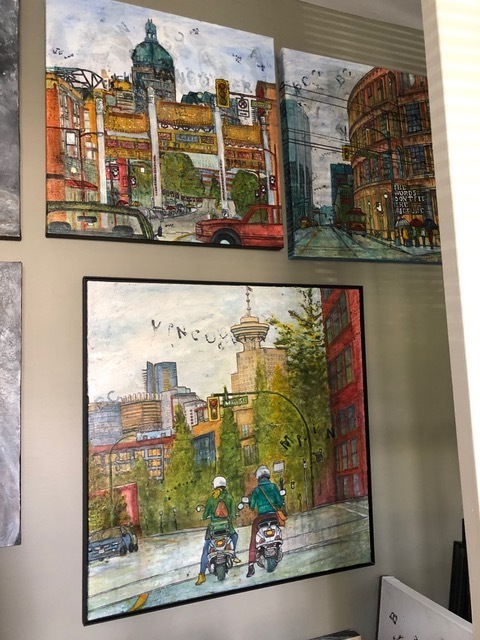 Walk into Barb’s lovely spacious home and take a sharp left into her City Studio. There are images of wild animals, her latest passion. City scapes and abstracts are there to greet you. It’s a tiny compact work space but her ideas are huge. 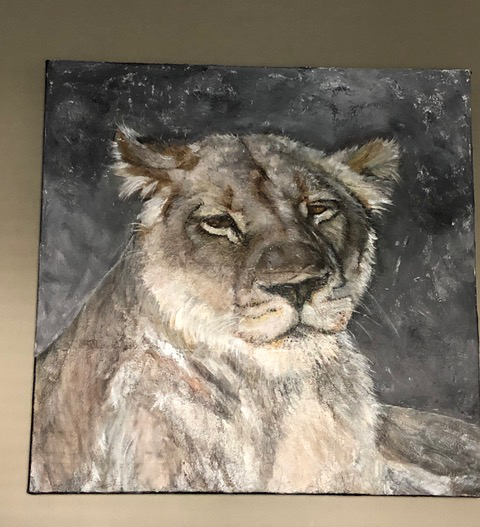 I was immediately struck by the 4 painting of animals she has photographed during her travels. Over the years her husband has taught her his incredible skill for photography. "It's a game at times as to who can get the best photo". Meet one of her newest, a black-tufted marmoset (mico estrella) from Brazil, a very intense fellow and I love how Barb has perfectly balanced the detail with just the right amount of abstract to allow the wildness to come forth. She has lifted this gnarly mischievous creature right out of the photograph and into its own. Barb simply has an affinity and with wild animals..
And this lioness, so majestic and dozy. She looks like she is thinking or day dreaming but maybe she is just being her lioness self. The point is, is that Barb has skillfully drawn me into wonder about this lioness’s inner life. Barb’s first ever painting, in grade 4, won an award. Now she is coming home to her affinity and passion for animals after years of exploring many ideas. Don’t get me wrong, she’s still delighting in exploring and trying new techniques and ideas. The folds of fur seem so soft over these powerful muscles at rest and those eyes! . Barb loves painting the fine details as much as letting loose into her abstracts. This is from a series that is work in progress. Here she has layered sheets of gold and silver leaf, painted them with her secret formulas of patina then sets them in the sun to 'tarnish' is particular ways. In this one she will bring out the mountains, trees and reflections and what ever else inspires her but even at this stage of un-finish, it shimmers. 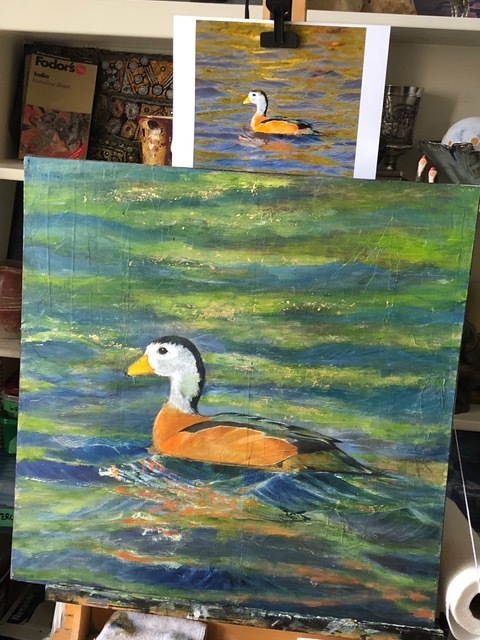 This is an African pygmy goose (Nettapus Auritus) she is currently working on. The goose is easier to paint than that illusive golden light on the water but no doubt she will succeed, she loves a good challenge. Can you see the formulas flying around like birds? Her mathematician daughter has inspired a fascination of all things mathematical. Each formula relates to a particular part of the painting; the curve of the tracks (all in BC), the weather patterns, the lay of the land, they are all correct mathematical formulas in flight. Even in her bright and happy city scapes you’ll find illusive names of cities hidden in the clouds and little formulas flying around calling out the angles and lines and forms of everywhere. Now, Let’s talk about her Country Studio. Every Spring she drives about an hour east to her little painting paradise to paint. There is enough land to park a tiny trailer, no electricity (a bit borrowed from kind neighbours) her running water is a little stream with a waterfall for washing. There are trees all around to prop her canvases on and lend her shade as she lets loose into her abstract orchestrations. They are big (and soon will get bigger … a tip from another outdoor painter… wild and free, they flow with an ease of skill and play. Picture this, She brushed on paint here and there in her special way to create her composition then she took her garden rake (!) … but she’ll use what ever tool she can find to work her painting into being. Yes, totally Love what you do, as Barb clearly does.